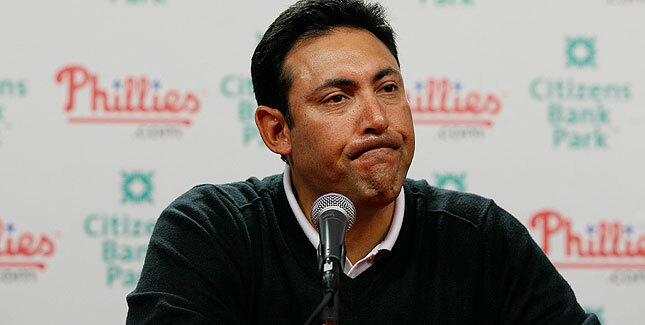 Philadelphia, PA – Bob Lamonte, famed agent known for molding former executives into possible NFL coaches and MLB managers, revealed to the Coggin Toboggan today he had no idea Ruben Amaro Jr. was fostering ideas of becoming the manager of a professional baseball team. Lamonte said he had taken Amaro Jr. under his wing to help him transition into the “next phase of his life,” which he did not think was going to involve making spur of the moment on-field decisions that would affect an entire sport franchise. “When he said he wanted to become a manager, I thought he was talking about a Chipotle or Burger King, not the manager of a baseball team. That’s just absurd,” the frazzled Lamonte said. “I haven’t even been talking to him about baseball during any of our meetings together. What was he thinking when I was trying to teach him how to operate a deep fryer and how to correctly use a mop wringer? Did he think baseball managers actually need to know that stuff? That’s ridiculous,” he said. Lamonte said he also taught Amaro Jr. the correct way to balance a checkbook, how to deal with unruly employees who demand more than a minimum wage salary, and the proper method of rolling a double-stuffed burrito. At press time, Amaro Jr. thanked Lamonte for his help and noted he had already updated the relevant skills portion of his resume to include proper restroom cleaning techniques. ← Could Steve Spurrier be the next head coach of the Philadelphia Eagles?